The March Hare, a celebration of words and music from Newfoundland, takes place at the Charles W. Stockey Centre this week. On Friday 2 March, beginning at 8:00 pm, you will find a crowd of some of he best musicians and poets from Newfoundland on the stage. When I encouraged Rex Brown to bring The Hare to Parry Sound 4 years ago, little did I know that I would be living part-time in Newfoundland and flying in and out of the St. John’s International Airport several times each year. Everyone flying into that airport is greeted by a huge painting by Gerry Squires. Near the baggage collection, and sometimes hidden by carts, is Caribou on the Witless Bay Barrens. 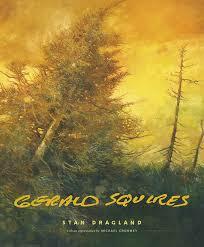 Stan Dragland’s most recent project, involving years of research, is a great big beautiful book about Gerald Squires, splendidly illustrated with his paintings. 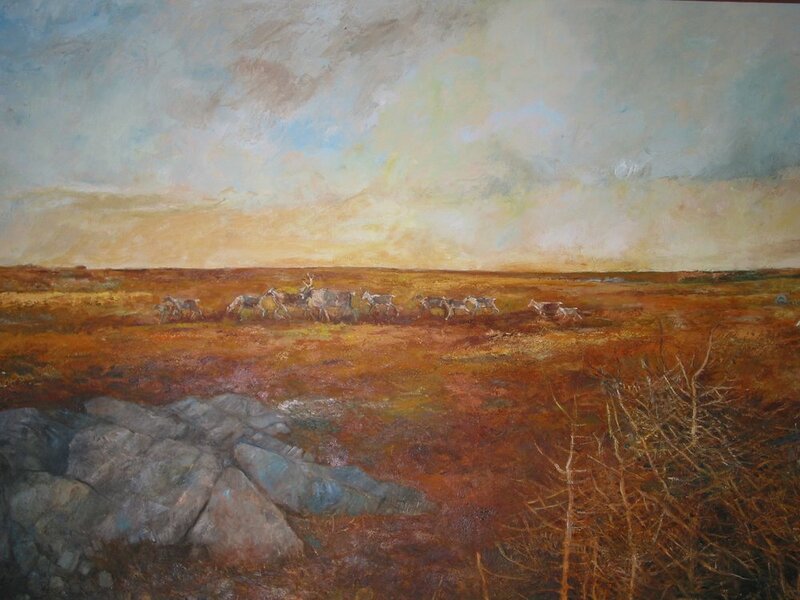 Squires’ work is iconic in Newfoundland but less known in the rest of the country. Working with an extensive archive Stan Dragland has written a richly interpretive essay informed by Squires’ own uncollected poetry, fiction, letters, and essays. Quoted as saying he fell “for Newfoundland like a lover”, Stan has made his home in St. John’s for many years. Part of the Canadian literary landscape for a good long time, Stan Dragland was a founding editor of Brick Books, a former poetry editor for McClelland and Stewart, a poet, a novelist, and editor, and writer of essays and criticism. Kathleen Winter, born in England, grew up in Newfoundland, and now makes Montreal home. Well known internationally for her novel Annabel, her most recent novel Lost in September was nominated for the Governor Generals Literary Award for Fiction last fall, when she appeared with the International Festival of Authors in Parry Sound. While reading the letters of General James Wolfe in the archives of the Thomas Fisher Rare Book Library, Kathleen’s imagination took flight and her book became a work of fiction, rather than fact, allowing her to tell the story of General James Wolfe in tandem with that of a modern day soldier. Pamela Morgan returns this year to perform new work. Over the past seven years or so she has been concentrating mostly on refining and developing an original folk opera, The Nobleman’s Wedding. This beautiful folk musical was performed at The Rising Tide theatre in Trinity, Newfoundland last fall. Based upon the gorgeous melodies and classic stories in ballads from Newfoundland’s rich oral tradition, it is a story where love, lust, faith, hope, and betrayal come together. Dr. Pamela Morgan has been learning and arranging Newfoundland ballads for forty years, concentrating on the more rare and obscure treasures with their timeless truths and intricate modal melodies. She is also working on a new musical based upon Tom Dawe’s poem The Frog Prince. The frog, finding himself in the stuffy dry palace after the metamorphic kiss, yearns for his wetland home and the friends he left behind there. Pamela will be playing excerpts from both projects, as well as something from her book of piano arrangements of Newfoundland Ballads, and a new commissioned composition dealing with abuse of children by the clergy; timely in these days of truth and reconciliation. With poets and writers Randall Maggs, Stephanie McKenzie, Stan Dragland and Kathleen Winter, and musicians Anita Best, Sandy Morris, Pamela Morgan and Douglas Cameron The March Hare will the biggest and best yet!